Server Essentials is an edition aimed at small organisations that includes 25 Client Access Licenses (CALs). 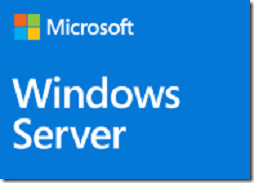 If you go beyond that you have to upgrade to Windows Server Standard at a much higher cost. There are some restrictions in the product, such as lack of support for Remote Desktop Services (other than for admin use). 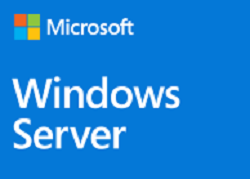 Microsoft has already greatly reduced its server offering for small businesses. 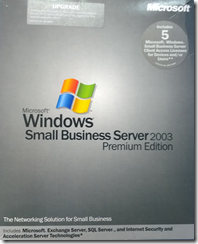 Small Business Server, the last version of which was Windows Small Business Server 2011, bundled Exchange, SharePoint and System Update Services, and supported up to 75 users. “Capabilities that small businesses need, like file sharing and collaboration are best achieved with a cloud service like Microsoft 365,” says the team, though also observing that Server 2019 will be supported according to the normal timeline, which means you will get something like mainstream support until 2024 and extended support until 2029 or so. Good decision? There are several ways to look at this. Microsoft’s desire for small businesses to adopt cloud is not without self-interest. The subscription model is great for vendors, giving them a consistent flow of income and a vehicle for upselling. Cloud also has specific benefits for small businesses. Letting Microsoft manage your email server makes huge sense, for example. The cloud model has brought many enterprise-grade features to organisations which would otherwise lack them. Despite that, I do not altogether buy the “cloud is always best” idea. From a technical point of view, running stuff locally is more efficient, and from a business point of view, it can be cheaper. Of course there is also a legacy factor, as many applications are designed to run on a server on the local network. Businesses do have a choice though. Linux works well as a file and print server, and pretty well as a Windows domain controller. Network attached storage (NAS) devices like those from Synology and Qnap are easy to manage and include a bunch of features which are small-business friendly, including directory services and even mail servers if you still want to do that. A common problem though with small businesses and on-premises servers (whether Windows or Linux) is weak backup. It makes sense to use the cloud for that, if nothing else. Although it is tempting to rail at Microsoft for pulling the rug from under small businesses with their own servers, the truth is that cloud does mostly make better sense for them, especially with the NAS fallback for local file sharing. At last month’s @Scale conference in San Francisco, developers from a number of well-known companies (Google, Facebook, Twitter, Dropbox and others) spoke about the challenge of scaling applications and services to millions or even billions of users. Among the speakers was Igor Zaika, Distinguished Engineer in the Microsoft Office team, and the video (embedded below) is illuminating not only as an example of how to code across multiple platforms, but also as an insight into where the company is taking Office. Zaika gives a brief résumé of the history of Office, mentioning how the team has experienced the highs and lows of cross-platform code. 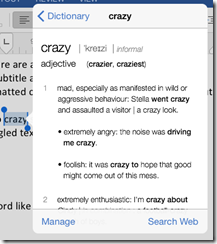 Word 6.0 (1993) was great on Windows but a disaster on the Mac. The team built an entire Win32 emulation layer for the Mac, enabling a high level of code reuse, but resulting in a poor user experience and lots of platform-specific bugs and performance issues in the Mac version. Next came Word 98 for the Mac, which took the opposite approach, forking the code to create an optimized Mac-specific version. It was well received and great for user experience, but “it was only fun for the first couple of years,” says Zaika. As the Windows version evolved, merging code from the main trunk into the Mac version became increasingly difficult. Today Microsoft is committed not only to Mac and Windows versions of Word, but to all the major platforms, by which Zaika means Apple (including iOS), Android, Windows (desktop and WinRT) and Web. “If we don’t, we are not going to have a sustainable business,” he says. WinRT is short for the Windows Runtime, also known as Metro, or as the Store App platform. Zaika says that the relationship between WinRT and Win32 (desktop Windows) is similar to that between Apple’s OS X and iOS. 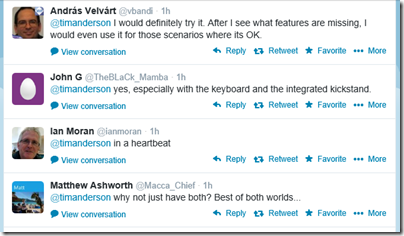 Time for a brief digression of my own: some observers have said that Microsoft should have made a dedicated version of Windows for touch/mobile rather than attempting to do both at once in Windows 8. The truth is that it did, but Microsoft chose to bundle both into one operating system in Windows 8. Windows RT (the ARM version used in Surface RT) is a close parallel to the iPad, since only WinRT apps can be installed. What seems to be happening now is that Windows Phone and Windows RT will be merged, so that the equivalence of WinRT and iOS will be closer and more obvious. Microsoft’s goal with Office is to achieve high content fidelity and consistency of functionality across all platforms, but to use native UX/UI frameworks so that each version integrates properly with the operating system on which it runs. The company also wants to achieve a faster shipping cycle; the traditional two-year cycle is not fast enough, says Zaika. What then is Microsoft’s technical strategy for cross-platform Office now? The starting point, Zaika explains, is a shared core of C++ code. Office has always been written in C/C++, and “that has worked out well for us,” he says, since it is the only language that compiles to native code across all the platforms (web is an exception, and one that Zaika did not talk much about, except to note the importance of “shared service code,” cloud-based code that is used for features that do not need to work offline). In order for the shared non-visual code to work correctly cross-platform, Microsoft has a number of platform abstraction layers (PALs). No #ifdefs (to handle platform differences) are allowed in the shared code itself. However, rather than a monolithic Win32 emulation as used in Word 6.0 for the Mac, Microsoft now has numerous mini-PALs. There is also a willingness to compromise, abandoning shared code if it is necessary for a good platform experience. 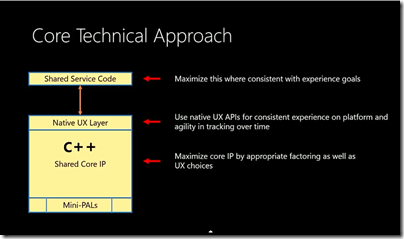 How do you ensure cross-platform fidelity in places where you cannot share code? The alternative is unit testing, says Zaika, and there is a strong reliance on this in Office development. 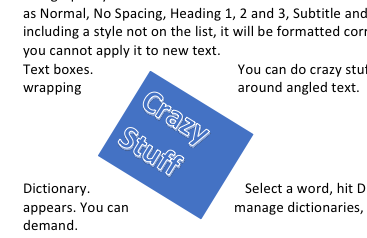 There is also an abstraction layer for document rendering. Office requires composition, animation and touch APIs on each platform. Microsoft uses DirectX on Win32, a thin layer over Apple’s CoreAnimation API on Mac and iOS, a thin layer over XAML on WinRT, and a thinnish layer over Java on Android. 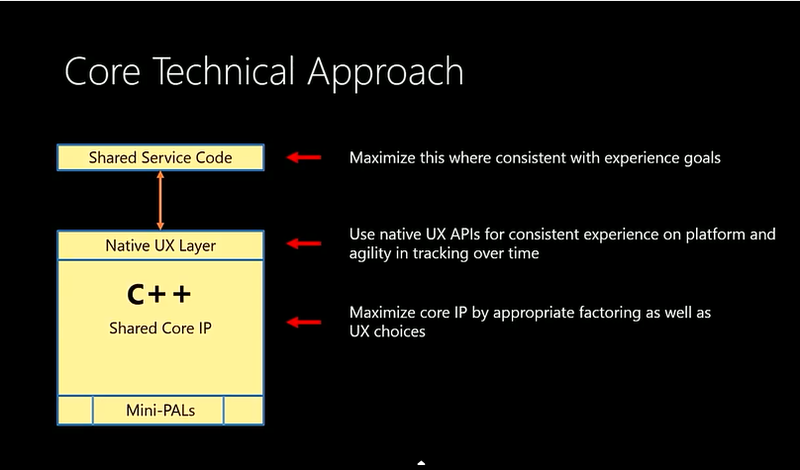 The outcome of Microsoft’s architectural work is a high level of code sharing, despite the commitment to native frameworks for UX. 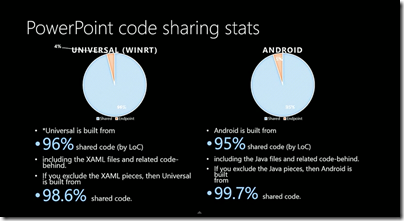 Zaika showed a slide revealing code sharing of over 95% for PowerPoint on WinRT and Android. What can Microsoft-watchers infer from this about the future of Office? 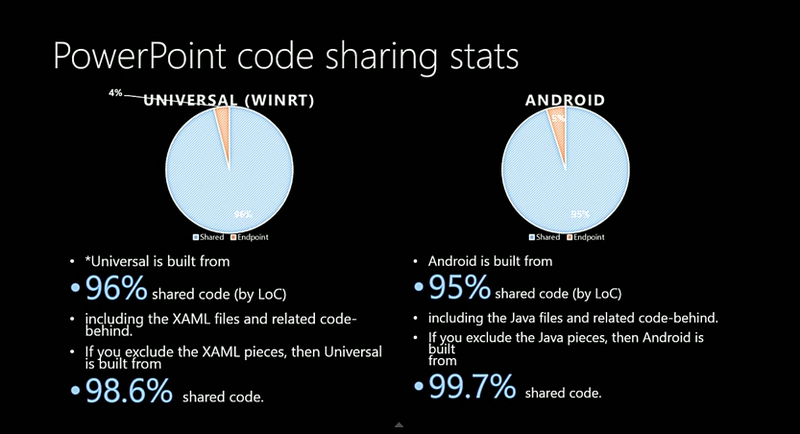 While there are no revelations here, it does seem that work on Office for WinRT and for Android is well advanced. Office for WinRT has implications for future Windows tablets. If a version of Office with at least the functionality of Office for iPad runs on WinRT, there is no longer any need to include the Windows desktop on future Windows tablets – by which I mean not laptop replacements like Surface 3.0, but smaller tablets. That will make such devices less perplexing for users than Surface RT, though with equivalent versions of Office on both Android and iOS tablets, the unique advantages of Windows tablets will be harder to identify. Thanks to WalkingCat on Twitter for alerting me to this video. I have great admiration for Nuance Dragon Naturally Speaking, mainly because of its superb text recognition engine. 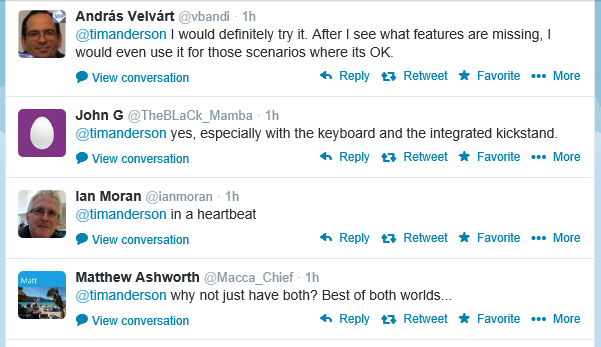 New versions appear regularly and the recognition engine seems to improve a little each time. 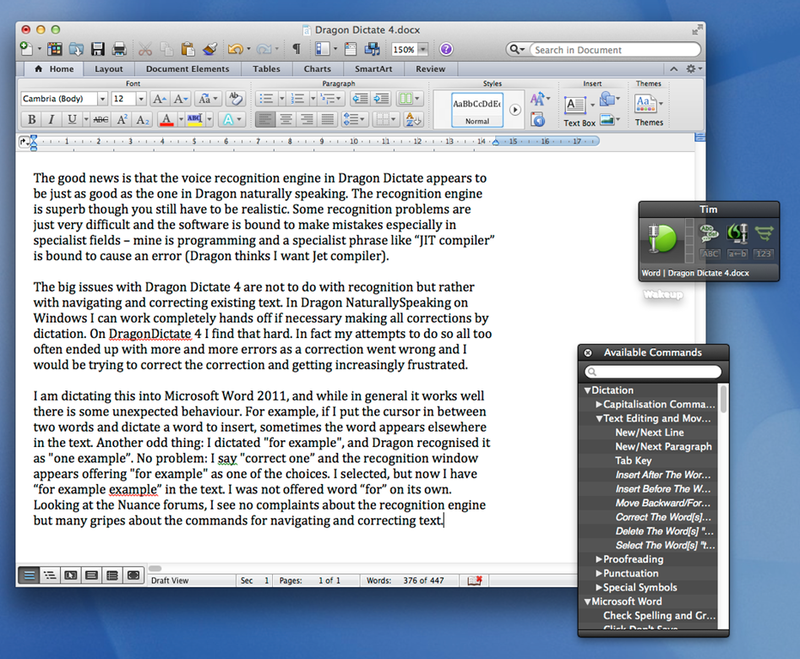 The recently released version 13 is no exception, and I am getting excellent results right now as I dictate into Word. If you are still under the illusion that dictation is not viable unless you are unable to type, it may be that you have not tried Dragon recently. Another possibility is that you tried Dragon with a poor microphone. I recommend a high quality USB headset such as those from Plantronics or Jabra. USB is preferred since you are not dependent on the microphone preamplifier built into your PC, which is often poor. At the same time, Dragon can be an intrusive application. The problem is that Dragon tries to accomplish two distinct tasks. One is to enable dictation and to some extent transcription of recordings, which is something anybody might want to take advantage of. For example, one of my uses is transcribing interviews, where I play my recording into a headset and read it back into the microphone. It is a lot quicker than the normal stop-start typing approach and even if it is a little less accurate the time-saving is worthwhile. Incidentally, Dragon is nowhere near smart enough yet to transcribe an interview directly. Background noise combined with the variety of accents used make this generally a hopeless task. In principle though, there is no reason why software should not be able to accomplish this as both processing power and algorithms improve so watch this space. The other task for which people use Dragon is as an assistive technology. Those unable to use mouse and keyboard need to be able to navigate the operating system and its applications by other means, and Dragon installs the hooks necessary for this to work. This is where the intrusive aspect comes to the fore, and I wish Dragon had a stripped down install option for those who simply want dictation. That said, it is possible to configure it as you want. Because of this kind of annoyance, I tend to avoid Dragon’s add-ons for applications like Microsoft Outlook and Internet Explorer. If you are using Dragon as an assistive tool though, you probably need to get them working. Dragon can be fiddly then, which is why users who dive in and expect excellent results quickly may well have a bad experience. Speech recognition and interaction with applications that were primarily designed for mouse and keyboard is a hard task; you will have to make some effort to get the best from it. I like the Learning Center, which is a genuine help until you are familiar with all the commands. It works, but this seems to be work in progress. Dragon is really a desktop application, and I found that some commands would mysteriously bounce me back to the desktop, and others just did not work. For example, the Bar prompted me to open the Dictation Box for an unsupported application, and moments later informed me that it could not be used here. Another issue is that the Bar sits over the full-screen app, obstructing some of the text. You can workaround this by shunting it to the right. My guess though is that you will have a frustrating time trying to use Dragon with Store apps; but it is good to see Nuance making the effort. What else is new? Well, Nuance has made it easier to get started, and no longer forces you to complete a training exercise (training Dragon to understand you, not you to understand Dragon) before you can use a profile. It is not really a big change, since you should do this anyway in order to get good results. There is also better support for web browsers other than Internet Explorer. In particular, there are extensions for Chrome and Firefox which Nuance says gives “full text control”. If you want or need speech to text, Dragon is the best option out there, much better in my experience than what is built into Windows, and better on Windows than on a Mac. In that respect, I recommend it; though with the caveat that you should work with a high quality microphone and be willing to invest time and effort in training its recognition engine and learning to use it. If you have an earlier version, even as far back as 11, is 13 worth the upgrade? That is hard to say. 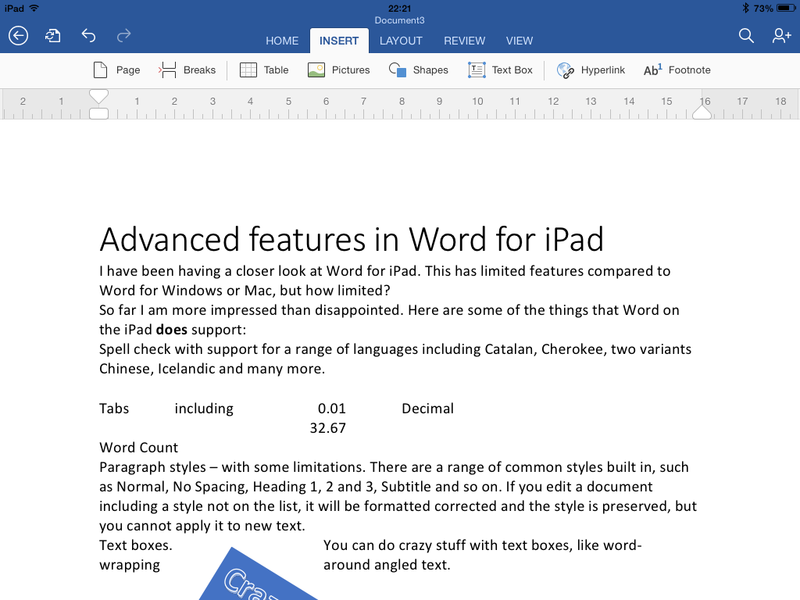 The user interface changes are mostly cosmetic; but if you use the latest Microsoft Office then getting the latest Dragon is worth it for best compatibility. The other factor is the gradually improving speech recognition. Comparing the accuracy of, say, version 11 with version 13 would be a valuable exercise but sadly I have not found time to do it. I can report my impression that it makes fewer errors than ever in this version, but that is subjective. Frankly, if you use dictation a lot, get the latest version anyway; even small improvements add up to more productivity and less frustration. Do you need the new Raspberry Pi B+? An updated Raspberry Pi board was released earlier this month, and the kind folk at Element 14 sent me one to review. The Raspberry Pi is a complete low-power computer which needs only a case, an SD card, and a standard USB power source to start doing real work. It is ideal for learning projects, home automation, practical applications like running a media server or client, or anything you can think of. It is a little over two years since the first Pi was shipped in April 2012. The progress is a little confusing: the first model was the B, followed by the A in early 2013, a cut-down model with a single USB port and no Ethernet. The new model has the same Broadcom BCM2835 SoC as all the other Pi models. The CPU is a 700 MHz ARM 1176JZ-F. The power draw is now 600 mA up to 1.8A at 5v, making it both lower power and higher power (when necessary) than the model B (750 mA up to 1.2A at 5v). The USB ports can supply a little more power, making most self-powered external hard drives usable, for example. The SD card slot has been replaced by a micro SD card slot, a good move (all my SD cards are in fact micro SD cards with adaptors, which is common). The GPIO (General Purpose Input Output) connector now has 40 pins rather than 26. The first 26 pins are the same as before, for compatibility. There are a few other changes which I noticed. One is that the LEDs have been moved. On the B, there are 5 LEDs which are together on the bottom right corner of the board: ACT (SD card access), PWR, FDX (Duplex LAN), LNK (Activity LAN) and 100 (100Mbit LAN connected). The B+ has two LEDs in the opposite corner, ACT and PWR, and two more LEDs on the LAN port itself. Personally I prefer the old arrangement. The audio output is improved, according to Pi inventor Eben Upton, thanks to a “dedicated low-noise power supply.” Raspberry Pi Engineer jdb adds that “The output impedance and buffering for the audio port has been improved and the maximum output amplitude has been increased (~1.25V pk-pk).” However one blogger measured the output and considered no better (or slightly worse). This is a push-fit case and even thought the board is held down by tabs, it moves and rattles slightly. I also worry about the case tabs breaking if you open it repeatedly. The tab that you need to press to open the case is sited by the micro SD slot, and that is another mistake, since it presses against the board making it hard to reopen after the Pi is fitted. There is also too much space below card slot so you can easily post your card into the case rather than into the slot if you are careless. Finally, I don’t like the way the top of the case slopes down, reducing the space above the GPIO at its shallow point. I wish I had seen this Cyntech case which looks miles better, for a similar low price, though I haven’t actually tried it. I do like the idea of an optional spacer which lets you increase the case height to fit add-on boards. Finally, a few notes on operation. If you have existing micro SD cards running on the B, they might or might not work on the B+. I use piCorePlayer as a streaming audio client, for which it is excellent, but my existing image would not boot on the B+. Following a tip elsewhere, I installed the latest piCorePlayer download on the B, updated it to version 1.16A using the web UI, and it then worked on the B+. I had no such problems with the standard Raspbian distro which worked fine on the B+. So do you need the B+? If you have not yet tried a Pi, give it a try, it is fabulous. If you already have a B, then you will find some nice improvements but nothing dramatic – though the extra USB ports in particular are most welcome. More information is on the Element14 site or of course the official site. Why bother taking written notes, when you can simply record the audio of a meeting or interview and listen to it later? I do this a lot, but it is problematic. You end up with an MP3 which has all the info within it, but with no quick way to find a half-remembered statement. Of course you can transcribe everything, or get it transcribed, but that is not quick; it will likely take longer than the original event if you want to transcribe it all, and even selective transcription is a slow process. You can get better at this, and I have formed a habit of noting times when I hear something which I am likely to refer to later, but standard audio players (such as Foobar 2000 or iTunes) are designed for music and not great for this kind of work. There is also an annoying problem with application focus if you want to transcribe a recording. You have Word open, you have your recording open in Foobar, but to control Foobar you have to switch focus away from Word, which means you cannot type until you focus back. There are utilities around to overcome this – my solution was to write my own Word macro which can pause and rewind a recording with keyboard shortcuts – but it is another issue to fix. Sonocent Audio Notetaker is an application for Windows or Mac dedicated to making sense of speech recordings. Audio Notetaker lets you create documents which include audio, text and images. If you have an existing audio recording, you can import it into a new Audio Notetaker documnent and start to work with it. The audio is copied into the document, rather than being added as a reference, so these documents tend to be large, a little larger than the original. The primary feature is the the way recordings are visualised and navigated. When you import a recording, it shows as a series of bars in a large panel, rather than the single horizontal scrolling view that most audio players present. Each bar represents a phrase, determined by Audio Notetaker according to pauses in the speech. This is not altogether reliable since speakers may pause mid-phrase, but you can split or merge bars if needed. The length of each bar varies according to the content, but typically seems to be around 3-15 seconds. You navigate the recording by clicking on the bars, and annotate it by assigning colours to bars according to your own scheme, such as blue for a potential quote, or brown for “boring, skip this”. If you are transcribing, you can type into either to two text panes, one of which is called Reference and the other just Text. When you are typing in one of these panes, you can use keyboard shortcuts to control the audio, such as Ctrl+Space for play/pause, Ctrl+\ to skip back, and Ctrl+/ to skip forward. The Reference and Text panes are functionally identical, but let you keep two different types of notes with one recording. There is also an image pane, which can include images, PDFs or PowerPoint presentations. How do you synchronise your notes or transcription with the audio to which it relates? Audio Notetaker does not do this automatically, but does allow you to insert section breaks which split the document into vertical sections. You can create these breaks with keyboard shortcuts. I would prefer it if Audio Notetaker automatically set hotlinks so that I could tell exactly what audio was playing when I made a note, but sections are nevertheless useful. For example, if you have an interview, a logical approach would be to make each question and each answer a section. Then you can easily navigate to the answer you want. You can use background colouring to further distinguish between sections. A common problem with audio recordings is that they are at too low a level. Audio Notetaker has its own volume control which can boost the volume beyond what is possible with the Windows volume control. There is also a noise cancellation button, to remove the dreaded hiss. Those are the basics; but Audio Notetaker has a few other capabilities. One idea is that you might want to record the content of an online conference. For this purpose, you can record from any of your input or output devices (it might seem strange to record from an output device, but this is the equivalent of a “what you hear” setting). 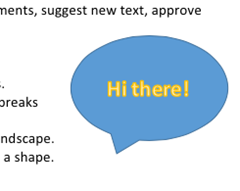 This approach is further supported by the ability to capture a screen and insert it into the document. When you choose the screen capture tool, you get a moveable, resizeable frame that you position over the area you want to capture. Another scenario is that you want to create a simple video with a PowerPoint slide show and an audio voiceover. You can do this by importing the PowerPoint and recording your speech, then choosing Export Audio and Images as Video (MP4 or WMV). 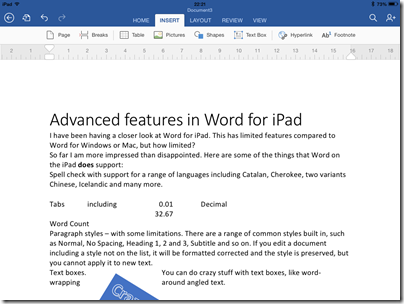 You can also export the text and images in RTF format (suitable for most word processors). Internally, Audio Notetaker uses Opus Audio Encoding which is an internet standard. You can also have Audio Notetaker read back text to you using the Windows text to speech engine (I am not sure how this works on a Mac). The best feature of Audio Notetaker is the way it lets you navigate an audio file. It is quicker to click on a bar in the panel than using a horizontal scroller or noting the time and going to that point. The sections work OK but I would personally like some way of embedding notes that are hotlinked to points in the audio with a finer granularity than sections. I am not sure of the value of features like importing PowerPoint slides, adding audio, and exporting as a video, when PowerPoint itself has support for narrations and export to video. I would prefer it if the developers focused on the core proposition in Audio Notetaker: making it easy to index, annotate and navigate speech recordings. I would also like to see integration with a transcription service. Automated transcription would be great but does not usually work well with typical field recordings; more realistically, perhaps Sonocent could integrate with Amazon’s Mechanical Turk or another service where humans will transcribe your recording for a fee. Nevertheless, Audio Notetaker is nicely designed software that addresses a poorly-served niche; well worth consideration for journalists, students, secretaries, takers of minutes, or anyone who uses audio recordings as part of their workflow. You can find Audio Notetaker on the Sonocent site, and obtain it as a free trial, or by subscription for a period, or with a perpetual licence. For example, six months for an individual license is £29.99; a perpetual licence is £95.99 (including VAT). It is available for PC or Mac. 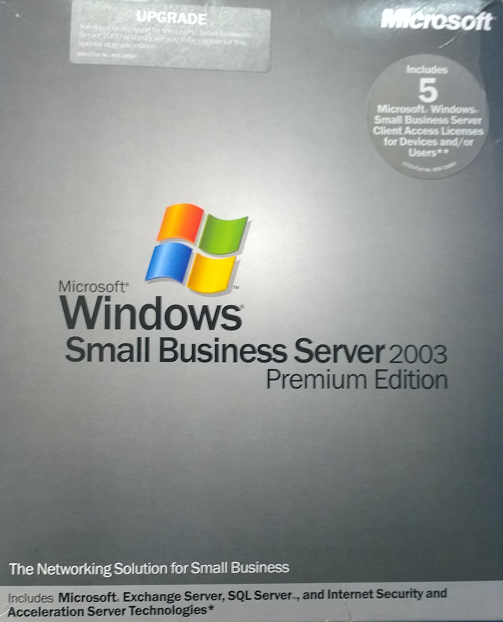 Recently I assisted a small business (of around 10 users) with a transition from Small Business Server 2003 to Server Essentials R2. Small Business Server 2003 had served it well for nearly 10 years. The package includes Windows Server 2003 (based on XP), Exchange, and the rather good firewall and proxy server ISA Server 2004 (the first release had ISA 2000, but you could upgrade). SBS 2003 actually still does more than enough for this particular business, but it is heading for end of support, and there are some annoyances like Outlook 2013 not working with Exchange 2003. This last problem had already been solved, in this case, by a migration to Office 365 for email. No problem then: simply migrate SBS 2003 to the latest Server 2012 Essentials R2 and everything can continue running sweetly, I thought. Sever Essentials is an edition designed for up to 25 users / 50 devices and is rather a bargain, since it is cheap and no CALs are required. In the R2 version matters are confused by the existence of a Server Essentials role which lets you install the simplified Essentials dashboard in any edition of Windows Server 2012. The advantage is that you can add as many users as you like; the snag is that you then need CALs in the normal way, so it is substantially more expensive. Despite the move to Office 365, an on-premise server is still useful in many cases, for example for assigning permissions to network shares. This is also the primary reason for migrating Active Directory, rather than simply dumping the old server and recreating all the users. The task then was to install Server Essentials 2012 R2, migrate Active Directory to the new server, and remove the old server. An all-Microsoft scenario using products designed for this kind of set-up, should be easy right? Well, the documentation starts here. The section in TechNet covers both Server 2012 Essentials and the R2 edition, though if you drill down, some of the individual articles apply to one or the other. If you click the post promisingly entitled Migrate from Windows SBS 2003, you notice that it does not list Essentials R2 in the “applies to” list, only the first version, and there is no equivalent for R2. Hmm, but is it similar? It turns out, not very. The original Server 2012 Essentials has a migration mode and a Migration Preparation Tool which you run on the old server (it seems to run adprep judging by the description, which updates Active Directory in preparation for migration). 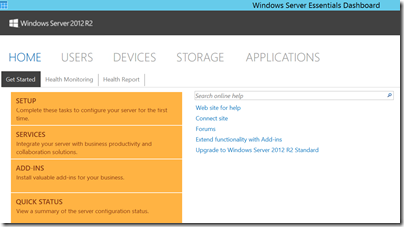 There is no migration tool nor migration mode in Server 2012 Essentials R2. So which document does apply? The closest I could find was a general section on Migrate from Previous Versions to Windows Server 2012 R2 Essentials. 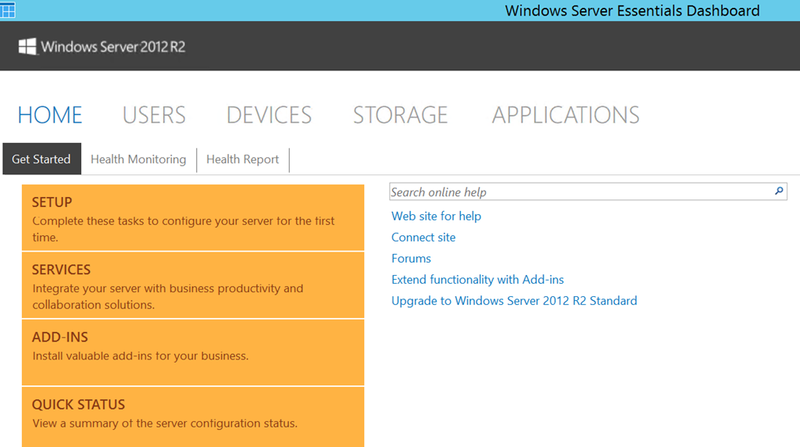 This says to install Server 2012 Essentials R2 as a replica domain controller. How do you do that? To install Windows Essentials as a replica Windows Server 2012 R2 domain controller in an existing domain as global catalog, follow instructions in Install a Replica Windows Server 2012 Domain Controller in an Existing Domain (Level 200). Note the “Level 200” sneaked in there! The article in question is a general technical article for Server 2012 (though in this case equally applicable to R2) aimed at large organisations and full of information that is irrelevant to a tiny 10-user setup, as well as being technically more demanding that you would expect for a small business setup. This message appears to relate to Exchange, but I think this is incidental. It just happens to be the first check that does not work. I think it was a WMI (Windows Management Instrumentation) issue, I did not realise this at first though. I should mention that although the earlier paper on migrating to Server Essentials 2012 is obsolete, it is the only official documentation that describes some of the things you need to do on the source server before you migrate. These include changing the configuration of the internet connection to bypass ISA Server (single network card configuration), which you do by running the Internet Connection Wizard. You should also check that Active Directory is in good health with dcdiag.exe. I now did some further work. I removed ISA Server completely, and removed Exchange completely (note you need your SBS 2003 install CD for this). Removing ISA broke the Windows Server 2003 built-in firewall but I decided not worry about it. Following a tip I found, I also used ntdsutil to change the DSRM (Directory Services Recovery Mode) password. I also upgraded the SBS AD forest to Server 2003 (it was on Server 2000), which is necessary for migration to work. I am not sure which step did the trick, but eventually I persuaded the PowerShell for creating the Replica Domain Controller to work. Then I was able to transfer the FSMO roles. I was relieved; I gather from reading around that some have abandoned the attempt to go from AD in Server 2003 to AD in Server 2012, and used an intermediate Server 2008 step as a workaround – more hassle. Browse to http://destination-servername/connect and install the Windows Server Connector software as if this was a new computer. The installation process is the same for domain-joined or non-domain-joined client computers. If you do that from a client computer that was previously joined to the SBS domain (having removed unwanted stuff like the SBS 2003 client and ISA client) then you are prompted to download and run a utility to join the new network. You do that, and it says you cannot proceed because a computer of the same name already exists. But this is that same computer! No matter, the wizard will not run, though the computer is in fact already joined to the domain. Make sure you have an admin user and password for the PC itself (not a domain user). Demote the computer from the domain and join it to a workgroup. Make sure the computer is fully removed from the domain. Then go to the connect URL and join it back. If you are lucky, the domain user profile will magically reappear with all the old desktop icons, My Documents and so on. If you are unlucky you may need manual steps to recover it, or to use profile migration tools. This is just lazy on Microsoft’s part. It has not bothered to create a tool that will do what is necessary to migrate an existing client computer into the Server Essentials experience (unless such a tool exists and I did not find it; I have seen reports of regedit hacks). The second annoyance was with the Anywhere Access wizard. This is for enabling users to log in over the internet and access limited server features, and connect to their client desktop. I ran the wizard, installed a valid certificate, used a valid DNS name, manually opened port 443 on the external firewall, but still got verification errors. All of the above is normal business for Microsoft partners, but does illustrate why small businesses that take on this kind of task without partner assistance may well run into difficulties. Looking at the sloppy documentation and missing pieces I do get the impression that Microsoft cares little about the numerous small businesses trundling away on old versions of SBS, but which now need to migrate. Why should it, one might observe, considering how little it charges for SBS 2012 Essentials? It is a fair point; but I would argue that looking after the small guys pays off, since some grow into big businesses, and even those that do not form a large business sector in aggregate. Google Apps, one suspects, is easier. An underlying issue, as ever with SBS, is that Windows Server and in particular Active Directory is designed for large scale setups, and while SBS attempts to disguise the complexity, it is all there underneath and cannot always be ignored. In mitigation, I have to say that for businesses like the one described above SBS has done a solid job with relatively little attention over many years, which is why it is worth some pain in installation. Update: A couple of further observations and tips. Concerning remote access, I suspect the wizard wants to see port 80 open and directed to the server. However this is not necessary as far as I can tell. It is also worth noting that SBS Essentials R2 installs TS Gateway, which means you can configure RDP direct to the server desktop (rather than to the limited dashboard you get via the Anywhere Access site). The documentation, such as it is, suggests that you use the router for DHCP. Personally I prefer to have this on the server, and it also saves time and avoids errors since you can import the DHCP configuration to the new server. My advice to Windows Phone users: complain. There is something liberating about working without a keyboard – and I do not mean stabbing hopefully at a touch screen. Voice control means you can sit back, easily refer to books or papers, and input text more quickly and naturally than is possible using a keyboard. Some conditions including RSI (Repetitive Strain Injury) may make dictation a necessity. I use dictation for transcribing interviews and for rapid text input generally. I do not often use dictation for controlling a computer, as opposed to entering and editing text, but this is also a key feature. Nuance has the best voice recognition system available as far as I can tell, though my experience is mainly with Nuance Dragon NaturallySpeaking on Windows. But what about Mac users? 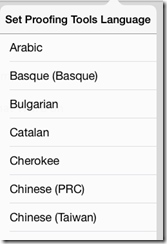 For them, Nuance provides Dragon Dictate, which has recently been updated to version 4. It is not a port of Dragon NaturallySpeaking, but rather has its own distinctive features, though it is less comprehensive, and a glance at the Nuance forums suggests that Mac users feel a bit neglected. Does Dragon Dictate 4 change that? The good news is that the voice recognition engine in Dragon Dictate appears to be just as good as the one in Dragon naturally speaking. The accuracy is superb though you still have to be realistic. Some recognition problems are just very difficult and the software is bound to make mistakes especially in specialist fields – mine is programming and a specialist phrase like “JIT compiler” is bound to cause an error (Dragon thinks I want “Jet compiler”). Similarly, “pull request” became “full request”. Over time you can build up a custom vocabulary, but recognition will never be 100%, so a dictation system has to handle corrections as well as original input. Setting up Dragon Dictate involves installing the software and then letting it create a profile and doing some training so that Dragon can learn the characteristics of your voice. I highly recommend using a good quality headset since without it we cannot expect accurate recognition. I found the setup process quick and painless and was soon up and running. 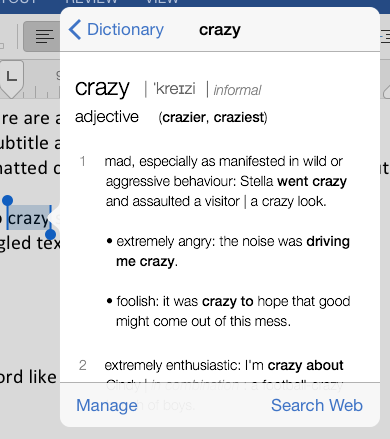 Dictation Mode is what you use most of the time. Spelling Mode is for spelling out problematic words. 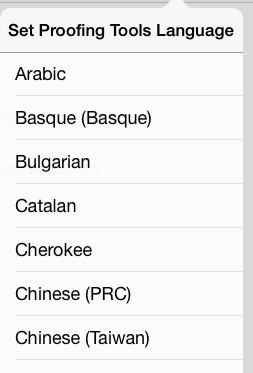 You can speak the letters naturally or use the International Radio Alphabet (Alpha Bravo Charlie etc). It is a nice feature since if you know Dragon is likely to get something wrong, you can switch to Spelling Mode, enter the difficult word, and then go back to Dictation Mode. Numbers Mode is for typing numbers. Command Mode is for non-dictation commands. However, commands also work in Dictation Mode. The advantage of Command Mode is that Dragon will not misinterpret your commands as text input; but there is no way to configure Dictation Mode to prevent it interpreting speech intended as text as commands. The manual suggests that you use unnatural pauses for this. For example, if you are reviewing Dragon Dictate and want to type “Command Mode”, you can say “Command [pause] Mode” and get what you want. Sleep Mode puts Dragon in a resting state, so for example you can take a telephone call without Dragon trying to transcribe it. Switching mode is easy: just speak the mode you want. If Dragon is in Sleep Mode, you can say “Wake up”. My initial experience with Dragon Dictate 4 was not too good. The problems were not with recognition but rather with navigating and correcting existing text, which I found harder than in Dragon NaturallySpeaking on Windows. In fact my attempts to make corrections all too often ended up with more and more errors as a correction went wrong and I would be trying to correct the correction, getting increasingly frustrated. 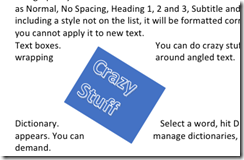 Using Microsoft Word 2011, I experienced unexpected behaviour. For example, if I put the cursor in between two words and dictated a word to insert, sometimes the word appeared elsewhere in the text. Another odd thing: I dictated "for example", and Dragon recognised it as "one example”. No problem: Dragon has a Recognition Window which lists alternatives when you say “correct” followed by the word you want to amend. I said "correct one” and the recognition window appeared offering "for example" as one of the choices. I selected it, but Dragon then entered “for example example” in the text. I was not offered the word “for” on its own. Dragon Dictate 4 was rescued from a terrible review when I studied the manual. Towards the end is a section entitled “The Cache and the Golden Rule”. This explains that you should not combine the use of keyboard and mouse with dictation when editing a document. If you do, Dragon gets confused about the contents of the document and you see unexpected results. You can fix this with a special command, “Cache Document”, which tells the software to clear and rebuild the cache for the entire document. If you are not aware of this issue, then you are likely to make increasing use of keyboard and mouse as Dragon gets it wrong, making the issue worse. That is exactly what had happened to me. Another key point is the difference between training and correcting. If you use the Recognition Window to make a change that is not in fact a recognition fault – such as changing “good” to “excellent” – then you will confuse the voice training. Rather, you should say “Select good”, to select the word you want to change, and then say “excellent” to overtype it. After studying the manual, I got much better results, though Dragon Dictate still occasionally seems to have a mind of its own. Nevertheless, this fussiness is a weakness in the software. The best software works the way you want it to, rather than making the user do things a certain way. Why cannot Dragon do its cache repairs automatically in the background? Still, what Dragon offers is of high value, and in this case if you want the best results you have to do the homework. There are a few others things to mention. Nuance offers a free app for the iPhone that lets you use it as a remote microphone. Personally I find a headset more convenient but I guess there are scenarios where this is useful. 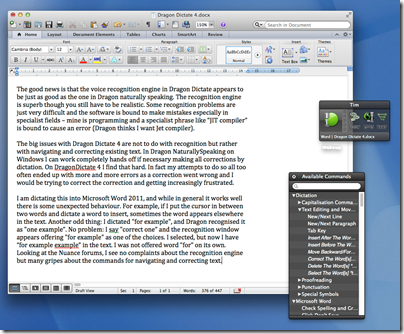 There are also features in Dragon Dictate aimed at general system control. I tried the MouseGrid, which overlays a grid over the entire screen and lets you zoom into the area of interest for accurate mouse control. You can also move the mouse using Up, Down and so on under voice control, and perform single, double or triple clicks. Conclusion? The software does not feel as complete or as polished as Dragon NaturallySpeaking, but the excellent voice recognition means that this is the best available for the Mac. Recommended, but with reservations.